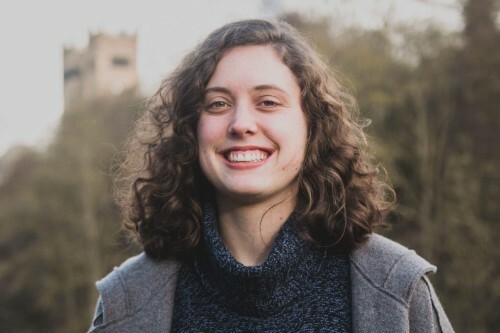 City student Lucy Knight has been announced as the winner of the 2019 Hugo Young Award at a ceremony on the evening of Thursday 21st March. Lucy was nominated alongside fellow MA Newspaper Journalism course-mates Harriet Whitehead and Sam Hall, along with a fourth student, Joanna York, from Edinburgh Napier University. The Hugo Young Award, hosted by the Guardian Foundation, celebrates the legacy of Hugo Young (a long-serving former political columnist for The Guardian, who died in 2003) by encouraging authentic voices, new perspectives and good political writing. Entrants submitted a political essay of between 900 and 1,000 words about a national or international news topic that they feel passionate about. They were then shortlisted by a panel made up of senior Guardian journalists and Guardian Foundation trustees. Lucy's winning entry was a powerful essay on her experiences as a gay Christian. 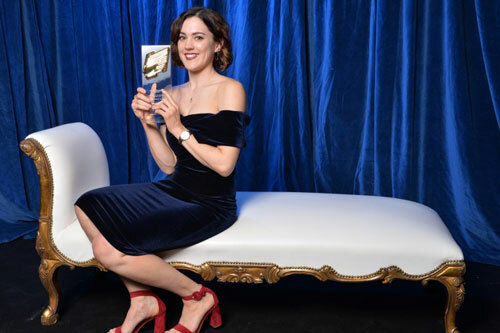 Lucy was presented with her award by Guardian editor Katherine Viner and deputy opinion editor Sonia Sodha, who is also chief leader writer for The Observer. As well as having her winning entry published in The Guardian, Lucy will be given the opportunity to shadow one of the newspaper’s political editors in the lobby and also receives a cash prize of £500. 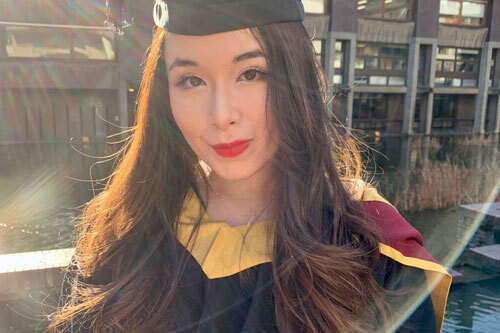 Lucy's prize is one of a number of notable awards and nominations for students and alumni from City, University of London’s Department of Journalism in recent weeks. On 7th March, Isabel van Brugen (MA Newspaper Journalism, 2018) won the Hugh Cudlipp Award at the London Press Club’s annual Hugh Cudlipp Lecture, which this year was delivered by Evening Standard editor and former Chancellor of the Exchequer George Osborne. In announcing Isabel as the winner, the judges commented that “every editor would want to publish” the investigative journalism for which she was nominated. She won the £1,000 prize having been “unanimously” chosen as the winner for her undercover investigation at an abortion clinic in Northern Ireland, published in The Times. 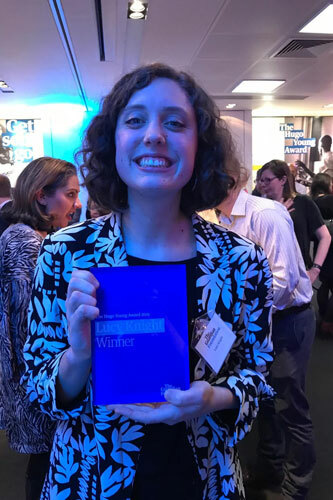 Isabel is one of a number of Department of Journalism alumni to have won the award, with winners in previous years including Simon Murphy, Ben Bryant and Billy Kenber. On 6th March, at the Royal Television Society’s annual awards, Anja Popp (MA Broadcast Journalism, 2013) won the Young Talent of the Year award for producing and reporting on a range of broadcasts for Channel 4 News. Head of Journalism Professor Suzanne Franks was in attendance to hear Anja give an acceptance speech at the awards. Anja’s work included a 10-minute film about Lindy Louise Pring, a homeless woman who lost her life while living rough on the streets of Cardiff. The report generated a huge response on social media and was shortlisted for the Orwell Prize. In a statement about the award, the RTS said: “This year saw several new and exciting young voices, but Anja Popp’s work has been quite extraordinary, both on and off camera. Prior to her victory, Anja Popp gave an interview to the RTS. 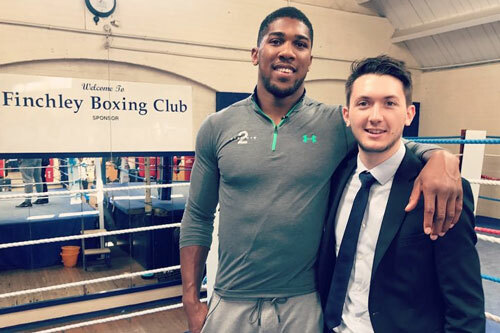 In February, Daniel Matthews (MA Newspaper Journalism, 2016) of the Daily Mail won the Sports Journalists' Assocation's award for Young Sports Journalist of the Year (also known as the Ian Wooldridge Award) at the SJA 2018 British Sports Journalism awards, based on three submitted articles. Daniel's submissions included a pair of hard-hitting boxing stories, one tackling the sport’s doping problem in the run-up to an Anthony Joshua fight and the other a revealing interview with Tyson Fury’s father just before the heavyweight fought Deontay Wilder. As well as winning awards, City’s journalism students also give them out. Students on the MA Magazine Journalism course produce an annual print magazine, XCity, as part of their course. Yesterday they announced the winner of their annual XCity Award, on the magazine's accompanying website, XCityPlus.com. The award honours a City alumni who has made an outstanding contribution to journalism in the past year. This year’s winner, collecting the £500 prize, is Sophia Smith Galer (MA Broadcast Journalism, 2017). Sophia is a visual journalist for BBC World Service and has also launched their Instagram channel. Also shortlisted were: James Waldron, Chemist+Druggist (MA Magazine Journalism, 2012); Madlen Davies, Bureau of Investigative Journalism (MA Magazine Journalism, 2012); Alex Morgan, The Cube (MA Television Journalism, 2015) and Leila Haddou, The Times (MA Investigative Journalism, 2012). For more details and reaction to an award that Sophie describes as “utterly thrilling”, head to XCityPlus's report. A raft of City alumni have been nominated for the National Press Awards for 2018, including Decca Aitkenhead, Ian Birrell, Sian Boyle, Tim Bradshaw, Jonathan Dean, Emily Dugan, Matt Lawton, Tom Payne, Eleanor Steafel, Steven Swinford and Janice Turner. The awards dinner will be held on Tuesday 2nd April 2019 at the Royal Lancaster Hotel. 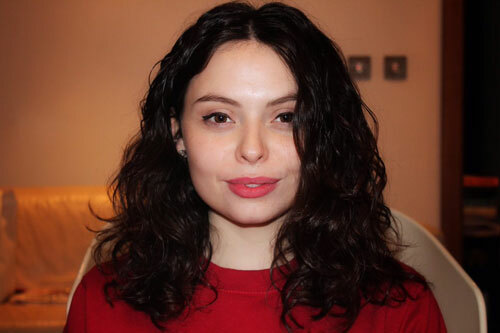 Human rights organisation Amnesty International UK has nominated Jessie Williams (BA Journalism, 2018) for the Student Journalist category in its Amnesty UK Media Awards 2019. Current City MA Interactive Journalism student Anisa Holmes was one of five winners of the Visualise 2030 competition. The competition, which was organised in collaboration between the World Bank, United Nations Foundation and the Global Partnership for Sustainable Development Data, challenged students to creatively use data to solve the world’s most pressing problems.